There are sometimes positions where we should make a positional chess sacrifice. I hear this phrase quite often from different chess players. That’s why it will be the topic of this issue. Many players think that they know all the chess basics already, and they don’t want to study them anymore. Actually it is a delusion, and it is a very common delusion. This idea is not as harmless as it looks, but it stops one’s chess progress. 1. Find your last 50 games. I hope that you collect your own games and save them in a separate database. Otherwise I strongly recommend that you start doing it, because self-analysis is one of the main ways for getting progress in chess. When you have such a database, you will find your last 50 games easily. 2. Look through these 50 games and mark the ones, where you made a positional sacrifice. In the end, please, calculate in how many games you made a positional sacrifice. NOTE: “A positional sacrifice” implies an intuitive decision, when you can’t prove the correctness of a certain sacrifice by concrete variations. Please, perform this step and only then read the text below. --> If you made a positional sacrifice in 5 games (or less) – then unfortunately, you don’t use this weapon regularly. Thus you DO NOT KNOW IT really. --> If you made a positional sacrifice in 10 games – then your result is normal (not excellent, but just OK). It means that you actually know what a positional sacrifice is, but you should still improve your skills here. What am I trying to illustrate with this test? 1. When you just know something (you’ve heard about it). 2. When certain knowledge becomes part of your personality. When you use it automatically. When it is integrated into your usual thinking process. In this case, you don’t need to repeat this knowledge regularly, because you will never forget it. You see that there is a great difference between these 2 levels. Only the 2nd level of knowledge allows you to APPLY it and TO GET PRACTICAL RESULTS. That’s why the phrase “I know it already” is so dangerous. When it SEEMS that you know something, you stop improving it. Thus you stop your own chess development. 1) Don’t assess yourself generally. Orient solely on THE FACTS (your practical results). Then you will really evaluate your skills. 2) Don’t think that you already know something, until you start using it automatically and start getting RESULTS from it regularly. 3) When you study my chess courses – perform ALL of the tasks seriously. I receive a lot of feedback from my pupils. That’s why I know which students achieve the best results. They perform ALL the tasks of a course, even when it seems unnecessary for them. After some time they get great practical results and then they understand why some tasks were so important. I want to express my appreciation for the transmission of knowledge. I have literally devoured each of your words and recommendations. I am eager to finish and to buy the next course that you recommend me. thousand and a thousand thanks for your contribution. Thanks a lot for being so fast on sending the chess course. I have seen the first lesson am very much impressed. I will go through it slowly to be able to profit as much as possible from it. Such persons (who study all the course’s materials seriously) always get good progress. It is a bit funny for me to read such e-mails :) My courses contain recommendations, which helped me and my pupils to become titled players. So when 2000 rating player says that “he knows it already”, I doubt it really. Actually his prejudice hampers his chess progress. This is how the phrase “I know it already” can stop your chess progress. Be careful! 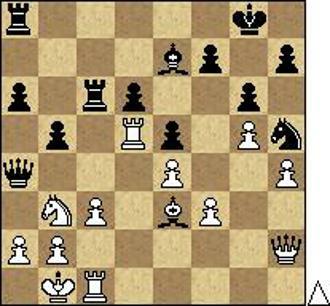 White: Kb1, Qh2, Rd5, Rc1, Be3, Nb3, pawns: a2, b2, c3, e4, f3, g5, h4. Black: Kg8, Qa4, Ra8, Rc6, Be7, Nh5, pawns: a6, b5, d6, e5, f7, g6, h7. You need to find the best move for white. Certainly you may not use a computer assistance). I’d like to give you the answer to the task I gave you above. Here white made a great move 30.Na1! After the following move Nc2 white will use the b4 or the e3 square to bring the knight to the d5. There followed: 30…Rcc8 31.Nc2-Qc4 32.Rd2-Rf8 33.Nb4-f5 and here after 34.Nd5 white got a clear advantage.